Like Paypal, Payza is a genuine, secured, worldwide and famous online payment processing platform for both individuals and merchants who carry out online businesses. In many ramifications, it is operated in similar ways as PayPal and you can easily fund, withdraw and request for fund with Payza with just an email address that serve almost like an account number. 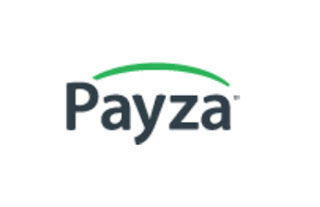 But unlike Paypal, Payza is available in over 190 countries without much limitations and restrictions. In fact we consider Payza as best alternative to Paypal because it is secured, flexible and with very easy to operate interface. Payza was formerly known as AlertPay, before at some point there was a transition to the current Payza. In today’s post, we are going to be taking through the steps of creating your first Payza account in less than 2 minutes. 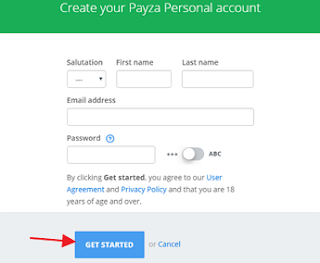 Opening a Payza account is fast, free, easy and simple, and without further ado, follow the steps bellow to open a Payza account. 4. Immediately after you choose Personal or Business, you will be taken to the next page where you will fill in your name, email and password; fill in all the required information there and make sure your password consist of at least a Capital LETTER and then click the Get Started button below the page. 5. A verification link will be sent to the email that you provided; now log into your mail and click on the verification link sent. Hurray! 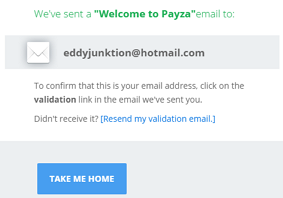 You have just created a Payza account. 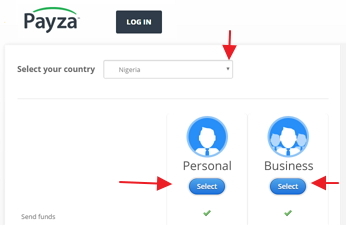 When you log in or have been taken into your Payza account, you need to complete your profile to have full access to Payza account. Payza allows easy Wire Transfer, credit card and Bitcoin funding and withdrawal in most countries and you can also do so via carefully selected Payza fund exchangers.